I was really fortunate in that I received a very generous game donation from Educational Insights, and wanted to review my new speech room additions for all of you fellow SLPs. I already owned several of the company's products, all of which are a hit with my students, so I knew to expect high quality games with solid educational value. My summer school students are the lucky cohort to sample these games first. 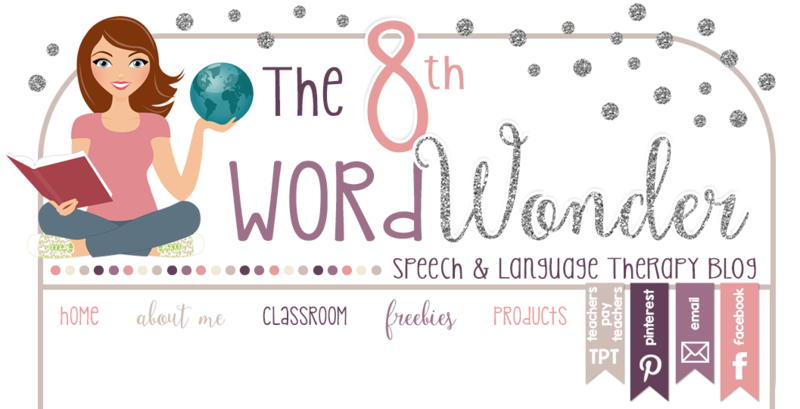 Over the next couple of weeks, I will be posting about how to use these games in speech therapy, so make sure to check back often! 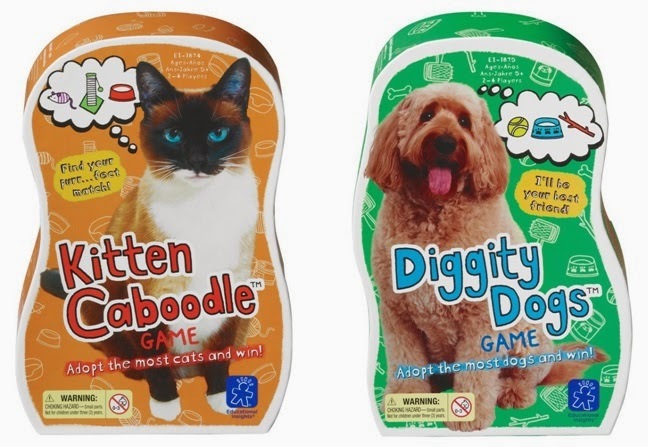 The first two games we tried out were Kitten Caboodle and Diggity Dogs. Both are essentially based on the same concept, but one version features cats, and the other version features dogs. If you know me, you know that I love kitties, so I was super excited about the cat version of this game >^..^< ! 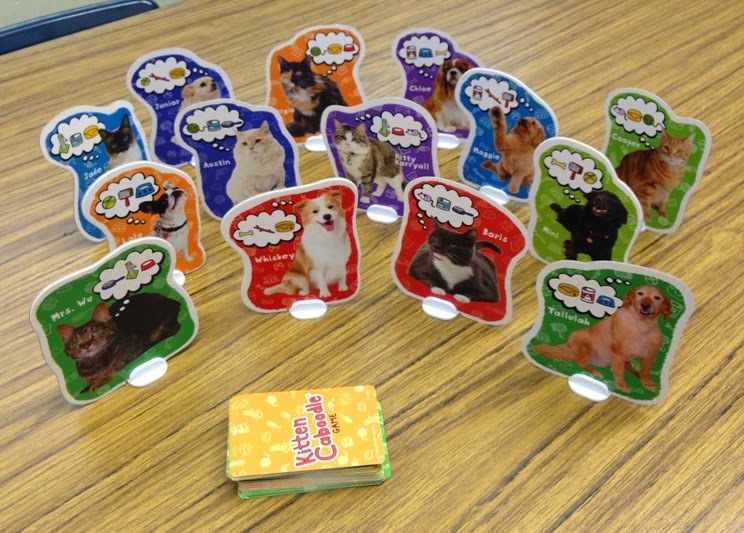 Each game comes with a deck of cards and a collection of seven cardboard cats or dogs, each of which have a thinking bubble. 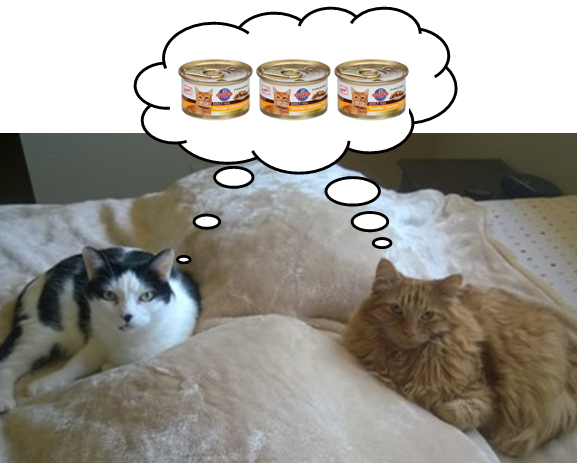 The thinking bubbles contain three items that the animal desires: a toy, food, a pet bed, etc. The cards contain pictures of the items. 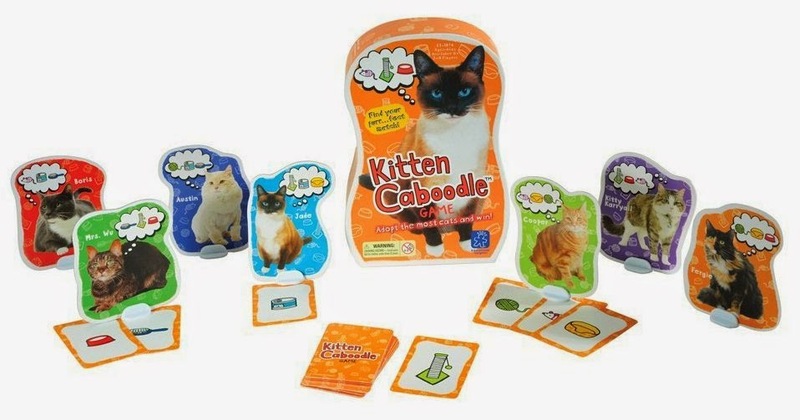 The object of this game is simple: Collect the set of desired items in order to adopt a particular cat or a dog. The game ends when all of the animals have found a home. Whoever ends up with the most animals, is the winner. The play style is similar to Go Fish: each player starts out with two picture cards from the draw pile, and takes turns asking other players for items they need. If the player does not get a match, s/he picks up a card from the draw pile. Once the three items are collected, a player gets to exchange the items for their animal. 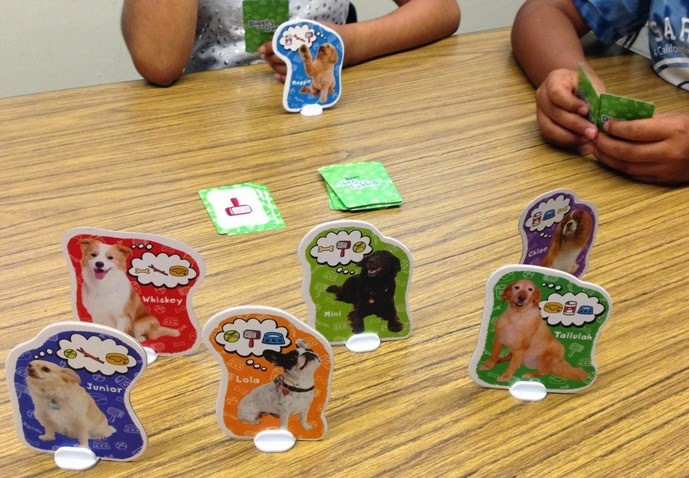 My 4th grade SDC students enjoyed the dog version of this game! It sounds simple enough, but unlike Go Fish, this game consists of much more planning and adds an aspect of competition to it when two players want to adopt the same animal (for some reason everyone was hell-bent on getting Austin, the cat). I love the logical thinking and memory components, as well: students need to figure out which items they already have and which animal would be the easiest to obtain given the cards they already own. They also need to remember who asked for certain items in previous turns. Some additional fun aspects described in the instruction booklet are as follows: 1. Have students ask in their best dog/cat voice, 2. customize the game by taping pictures of your own cat or dog onto the cardboard cut-outs. The instructions also feature a profile of each of the animals. Use both sets at once for an additional challenge! Another really cool modification I came up with to make the game more challenging for older students: mix both sets together! This will require students to engage in additional planning. And you won't have to choose between which game you want to play -- they both feature really endearing animals and you will want to adopt them all :). Perspective Taking: This game is awesome because it features THOUGHT BUBBLES! Yay! You can use the different animal cut outs to talk about that each animal has different desires and thoughts (much like people) and chat about the difference between thought bubbles and talking bubbles. Inferencing: You can do some basic inferencing practice - what do you think the dog wants the stick for? What do you think might be inside this can? Asking Questions: A lot of my students struggle with the grammatical structure of questions beginning with auxiliaries (do/can/is), so this offered a great way to practice this skill, since they had to ask players, "Do you have a..."
Logical Thinking / Problem Solving: Students have to think about the items they already have in their hand and which animals they could adopt with these items. They also need to think about which animals would be the easiest to adopt. For example, if they have a mouse and a ball of yarn, they would look to see if there is a cat who might like both of those items, and then plan what other item they should ask for. My cats have a one-track mind!